I decided to install Windows Update for the first time in a few months. After the installation I restarted Windows 7. When Windows loaded, only my wireless internet was working even though my MacBook is always connected to Ethernet. So I decided to try to fix the ethernet connection by checking all my wires and rebooted my modem/router. No luck. I then noticed the Local Area Connection icon was gone from both the network settings and the device manager. I tried looking online for a way to restore the ethernet but eventually decided to do a system restore at the point right before the Windows updates. This is where things go very wrong... Upon reboot I get a black error screen. See attached photo. I tried going through the options on the screen as well as all the options after restarting and pressing f8 to get to the advanced boot options. I still have access to my macOS partition which I rarely ever use. I have never downloaded any macOS updates. I can boot into that just fine but the Ethernet does not seem do be available either, although I'm not too familiar with MacOS. Only the wireless internet works for both partitions. My Ethernet cable runs into one end of a USB hub and the hub is connected via USB to my laptop. The other device on the USB hub is a pair of external audio speakers which are also not working on the macOS. However both devices show up on the system report so I guess the macOS recognizes them but they're just not working. 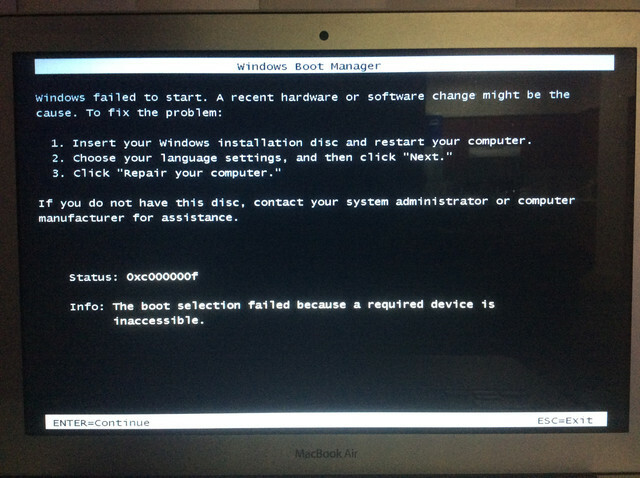 How do I get Windows to boot again? I need to make sure I don't lose personal files on my C:/drive in my Windows partition. It would be very difficult to do a clean install anyway because the process for loading windows 7 on a MacBook Air late 2012 model involves an extremely specific order for installing boot camp and windows drivers. Also could someone tell me why windows update destroyed my Ethernet connection? And why I couldn't boot after system restore?